The hike out to town this morning was only five miles. The sunrise was so nice, I even saw three deer! I arrived at the highway around 8am and saw Kristen. She said she hadn't seen a car drive by since she got there and was going to walk into town. I was a little worried since there was no shoulder. As more hikers filled in, we sat in a queue hoping to get a hitch. The morning is just slow and no one really drives by. We finally saw a car come up and drop off a few hikers, golden opportunity for us. We walked over and asked if we could get a ride into town. His name was Tom and was so nice! New stakes and lines from Zpacks! The best breakfast. So much food. We passed by Kristen who had already walked more than halfway into town and Tom let her know that he would come pick her up after he dropped us off in town. I first went to post office to pick up my package from Zpacks and mail a memory card to Jenny. We then headed to Evergreen Cafe for breakfast. I ordered a breakfast burrito and a side of hash browns. For some reason, I didn't have a huge appetite even though I was hungry. I ate half of the burrito and took the rest to go. 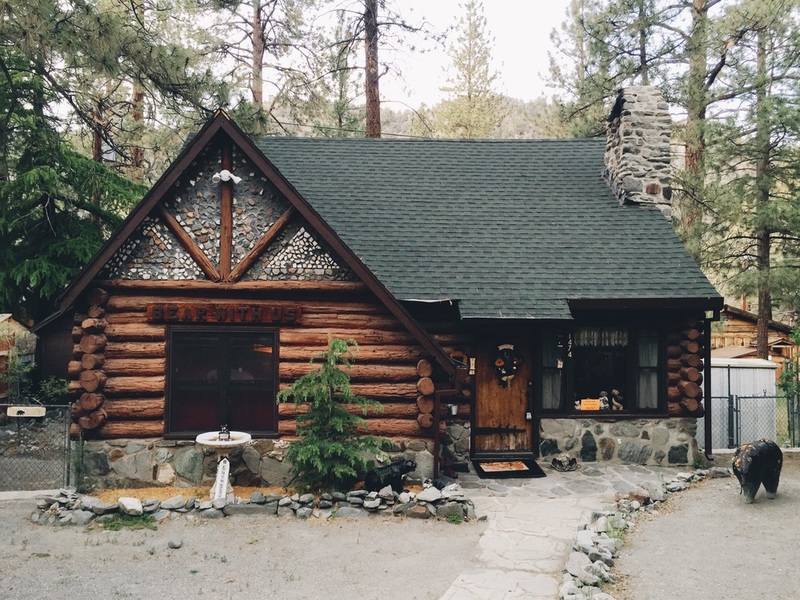 Our cute little cabin in Wrightwood. After breakfast, I walked over to Jensen's for resupply. I think I might be getting the hang of it. Everything in the store was expensive though, like a whole dollar more than at normal places. We did a little organizing outside and then loitered around town till our cabin was ready. We got this cute little 3 bedroom place in the neighborhood. I was not expecting this at all. We had a whole house to ourselves! Janet, the lady arranging everything came over to greet us. She was also doing laundry for us. So amazing. We all got into our long underwear and tossed everything we could in the laundry basket. Everyone took their showers and as always, it felt so good. It still takes like four washes to get all the dirt off. What hikers look like in town bc of laundry duties. I was getting some errands done and met the others at the Mexican place for margaritas. We hung out there for a bit and then checked out the farmer's market. I got a peach, nectarine, orange and apricots. My sciatica was hurting pretty bad in town, as per usual and our house was further out a bit. We came back home and chilled for a bit. I finished organizing my food and we all headed out to the Raccoon Saloon and then there was a live band playing at the Yodeler. I was pretty tired so I left around 830 to finish fixing my tent. I needed to tie new guylines on the frayed pieces. I'm hoping to catch up on some sleep tonight. I haven't slept very much these last few days since I've been waking up so early but also having long days. I'm so happy we have this cabin tonight and I have my own bedroom! Wrightwood is awesome.